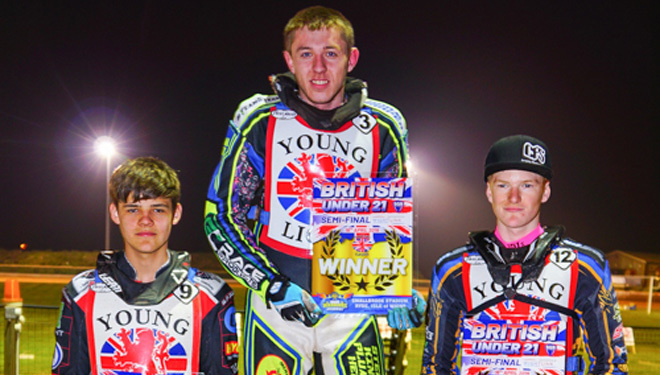 RYAN Kinsley, Jordan Palin and Anders Rowe have qualified for the British Under-21 Final. The trio were the top three finishers from Tuesday’s semi-final at the Isle of Wight, with Scunthorpe’s Kinsley racing through the card to a 12-point maximum in his qualifying races and then winning his semi and the meeting Final. 15-year-old Palin, who will make his National League debut with Belle Vue this weekend and who has already signed for Scorpions in 2020, picked up seven points in the qualifiers before finishing runner-up in both semi and Final, whilst Somerset and Kent rider Rowe collected eleven points, won his semi and then followed Kinsley home in the Final ahead of Kings’ team-mate Alex Spooner. Qualifying scores: Ryan Kinsley 12, Anders Rowe 11, Nathan Ablitt 8, Luke Ruddick 8, Jordan Palin 7, Jordan Jenkins 7, Alex Spooner 5, Jamie Bursill 5, Chad Wirtzfeld 4, Ben Woodhull 3, Connor King 1, Joe Alcock 0, James Laker (Reserve) 0.